Vine and Bigleaf Maples start to change into their Fall colours along the edge of Silver Lake in Silver Lake Provincial Park near Hope, British Columbia, Canada. Last night I was in the Eastern Fraser Valley near Hope, British Columbia. My destination was Silver Lake Provincial Park. 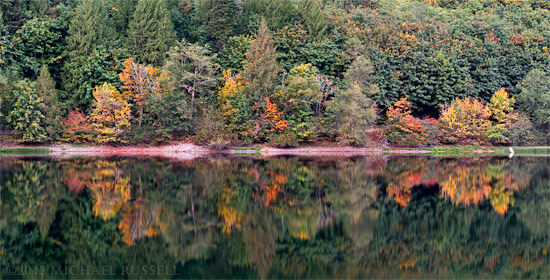 Years ago I stopped here after a storm had rolled through and managed to photograph a great reflection on the lake. Last night I was hoping that conditions would let me try this again, with a bit more exploration of the area. I was not disappointed, though there weren’t many clouds to make the sky a bit more interesting. The reflections were great, though the amount of fish jumping occasionally messed up the stillness of the water! 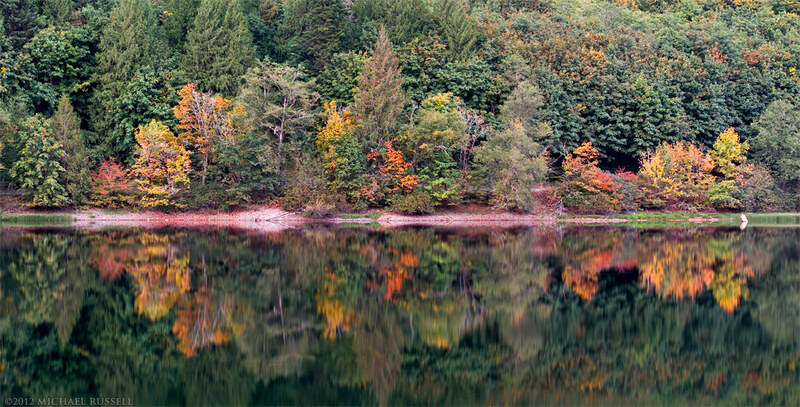 The trees reflected in Silver Lake are Bigleaf Maples (Acer macrophyllum) and Vine Maples (Acer circinatum). It is a bit early for such Fall colours, but with the amount of dry weather this area has had for the last few months, it seems some of the trees are packing it in early. More of my photos from this park can be found in my Silver Lake Provincial Park Gallery.